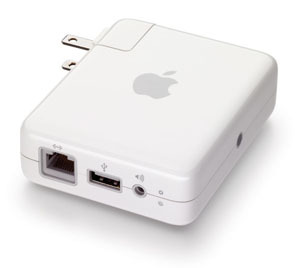 I recently purchased an Apple AirPort Express in order to listen to my iTunes music on my home stereo. The initial setup I had was the AirPort Express joined to my main wireless network. I was able to configure the AirPort by connecting to it wirelessly from my Mac and running the AirPort configuration utility to join it to my existing network. This configuration worked great. Eventually, I was able to plug the AirPort into my wired network. I set it up as a separate access point that I could use in a different area of the house and also used it to pipe some music to my stereo. This worked even better because there was no more wireless connection between the AirPort and the computer that was streaming music. Use the AirPort as a router for an internet connection and share the connection wirelessly. Operate as a wireless access point on an existing network. Become a client of another wireless network in order to stream music wirelessly. This turned out to be an incredibly useful, and tiny, device. It is also nice that Remote on an iPhone or iPod touch is able to control remote speaker volume and select which speakers music is played from.